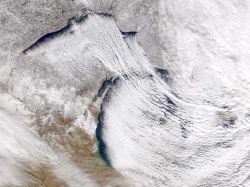 Lake effect snow is produced in the winter when cold, arctic winds move across long expanses of warmer lake water, providing energy and picking up water vapor which freezes and is deposited onto nearby land.The effect is enhanced when the moving air mass is uplifted by the orographic effect of higher elevations on the downwind shores. This uplifting can produce narrow, but very intense bands of precipitation, which deposit at a rate of many inches of snow each hour and often bringing copious snowfall totals. The areas affected by lake-effect snow are called snowbelts.If the air temperature is not low enough to keep the precipitation frozen, it falls as lake-effect rain. 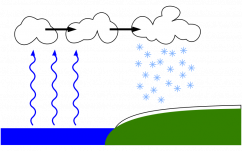 In order for lake-effect rain or snow to form, the air moving across the lake must be significantly cooler than the surface air (which is likely to be near the temperature of the water surface). Specifically, the air temperature at the altitude where the air pressure is 850 millibars (roughly 1.5 vertical kilometers) should be 13°C lower than the temperature of the air at the surface. Lake-effect occurring when the air at 850 millibars is much colder than the water surface can produce thundersnow, snow showers accompanied by lightning and thunder (due to the larger amount of energy available from the increased instability). The distance that an airmass travels over a body of water is called its fetch. 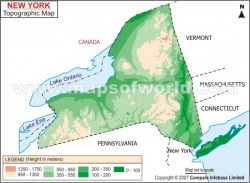 Due to the fact that most lakes are irregular in shape, different angular degrees of travel will yield different distances; typically a fetch of at least 100 km is required to produce lake effect precipitation. Generally, the larger the fetch the more precipitation that will be produced. Larger fetches provide the boundary layer with more time to become saturated with water vapor, and for heat energy to move from the water to the air. 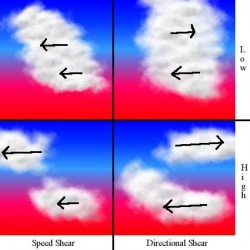 Directional shear is one of the most important factors governing the development of squalls, environments with weak directional shear typically produce more intense squalls than those with higher shear levels. If directional shear between the surface and 700mb level is greater than 60 degrees, nothing more than flurries can be expected at the most. If the directional shear between the surface and 700mb level is between 30 and 60 degrees weak lake effects bands are possible. In environments where the shear is less than 30 degrees strong, well organized bands can be expected. A lower upstream relative humidity will make it more difficult and time consuming for lake effect condensation, cloud and precipitation to form. The opposite is true if the upstream moisture has a high relative humidity allowing lake effect condensation, cloud and precipitation to form more quickly and in a greater quantity. Any large body of water upwind will impact lake effect precipitation to the lee of a downwind lake by adding moisture or pre-existing lake effect bands which can re-intensify over the downwind lake. It should be noted though that upwind lakes do not always lead to an increase of precipitation downwind. Vorticity advection aloft and large upscale ascent help increase mixing and the convective depth, while cold air advection lowers the temperature and increases instability. 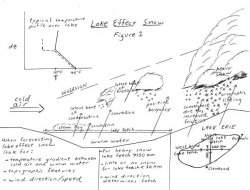 Typically lake effect precipitation will increase with elevation to the lee of the lake as topographic forcing squeezes out precipitation and dries out the squall much faster. 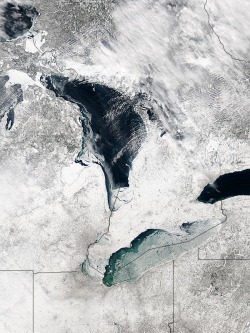 As a lake gradually freezes over its ability to produce lake effect precipitation decreases for two reasons. Firstly, the open ice free liquid surface area of the lake shrinks reducing fetch distances while secondly, the water temperature nears freezing reducing the overall latent heat energy available to produce squalls. In order to end the production of lake effect precipitation, a complete freeze is often not necessary. Even when precipitation is not produced, cold air passing over warmer water may produce cloud cover. Fast moving mid latitude cyclones, known as Alberta Clippers often cross the Great Lakes. After the passage of a cold front, winds tend to switch to northwest, and a frequent pattern is for a long lasting low to form over the Canadian Martitimes which may pull cold northwestern air across the Great Lakes for a week or more. Since the prevailing winter winds tend to be colder than the water for much of the winter, the southeastern shores of the lakes are almost constantly overcast, leading to the use of the term The Great Gray Funk as a synonym for winter. These areas allegedly contain populations that suffer from high rates of seasonal affective disorder ,a type of psychological depression thought to be caused by lack of light.